Businesses can improve their bottom line by changing the way they approach deploying memory on IBM z/OS®. Advances in z Systems memory packaging and pricing have radically shifted the balance between memory, I/O, and CPU, and now favor using large memory for both existing and new workloads. The new balance point optimizes infrastructure by concentrating on the value achievable with large memory instead of tuning to minimal memory usage. - Improve transaction response times. Internally, this raises productivity. Externally, it drives more sales. - Reduce CPU usage and improve CPU scaling. The former saves money, the latter adds flexibility. - Simplify memory management. Skills now spent tuning memory can be applied to driving business value. - Improve availability. Tolerate larger memory and I/O workload spikes. Enable faster recovery. - Deploy more of today’s memory-hungry workloads with IBM z Systems industry-leading security and lower total cost of ownership. 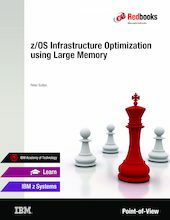 This IBM® Redbooks® Point-of-View publication describes the advantages of configuring z Systems products with large memory, including faster response time, lower CPU consumption, and higher availability. With the release of the IBM z13™, IBM is shifting the memory discussion from “Can I survive this year on my current memory footprint?” to “How can I use additional memory to drive new business value?” From higher system availability and customer satisfaction to increased sales and lower costs, these new large memory configurations have a lot to offer.